While sheep have been in Scotland for about 4500 years there isn’t evidence of short tail sheep being there until about 1200AD…and Shetland sheep are short tailed. The oldest Shetland lace we have is about 150 years old and it is incredibly intricate. We can surmise that this is a skill that has been around for quite some time but no definitive beginning can be known. But the tools involved with making Shetland lace speak to a developed skill that is fairly old and ensconced with the place. The ‘makkin’ belt is a distinctly Shetlandic knitting tool that allows for one handed knitting. Some women knit while they walked. Before the ‘makkin’ was a bundle of goose quills bound together to hold one needle in place. There are three major schools of lace knitting – Orenberg (Russian), Shetland, and Estonian. Shetland has stitches in it that aren’t found in the other two and perhaps that is because of its geographic remoteness. With stitch names like old shell, razor shell, bead, feather and fan, fern, and trailing leaf you have the sense that anyone who names stitches after such features was ensconced with the non-human world and the environment fairly deeply. Shetland lace is also unique in that it is fitted to a frame and knit from the outside edge towards the interior. The other two schools radiate out from the center. But the wool… Shetland wool is very fine, indeed. 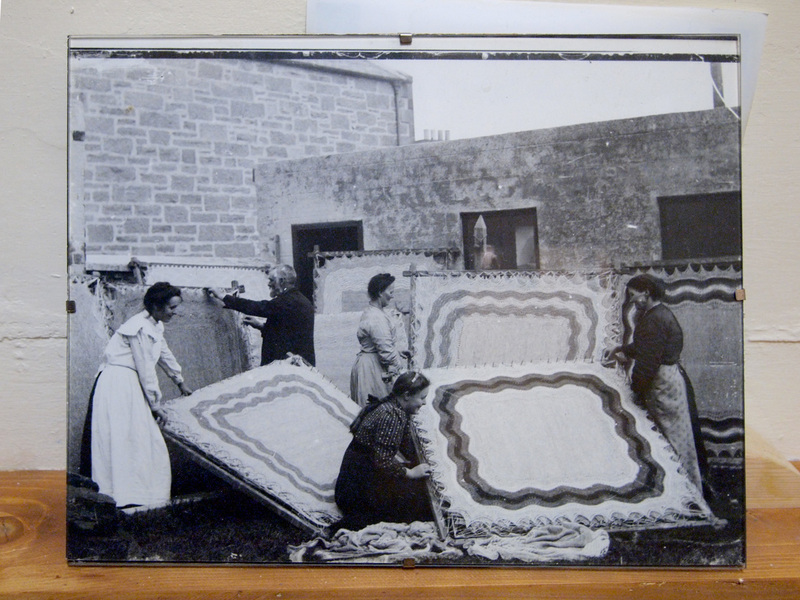 The wool was sheared by men but after that women washed, carded, spun and knit. And the best knitters and spinners were always older women. Young women were working the fields and going to market. But it was the grandmothers, unmarried women, widows, aunties. They were the ones who knew how to make that fine thread and make gossamer wraps. Who could count the miles of hair that slipped through their nimble fingers? How tender their hands must have been from all the lanolin? Even decent pieces took a year to make. I haven’t told you about where the wool for the best pieces comes from though… the throat. The finest wool on a Shetland sheep is from the throat. Tender, unexposed, touched less, thinner, finer. Now consider the terrifying mercy here. The sheep is run down, caught, flipped over, bound or held down and then sees the same dull glint it has seen before across the heath. Drawn from the hip of their protector is the very knife that had laid its lambs low. Siblings. Cousins. Parents. All slain by a cut across the jugular. There is a reason sheep might be sheepish. And in that moment the blade goes towards the very tender spot where sheep have been slashed for millennia – across the throat. And instead of plunging the knife a small patch is shaved bare. And then the sheep is released. All in service to beauty making. Terrifying mercy on that day. And eventually that knife will go in and the blood will run into the soil and the other sheep have seen it again. They won’t forget. You shouldn’t either – that there is a cost and a consequence to the maintenance of beauty in our world. The astonishing beauty of this lace is a wonder on a day full of mysteries. In the labor of making, in the gathering, is the earned relationship with an animal that those Shetlanders must play Abraham to their flock of Isaacs. Take them to the brink of death and then stay the hand. Perhaps any beauty making worth its salt has the sorrow of what was or what was to come close by to it. Sorrow might well be in the architecture and be in the architecture of real beauty. The Shetland Lace Shawl might be a fine example of one that does that well. Is the knife at our throats now in the state of the world for beauty making or for a kind of dizzy and leveling maintenance? I don’t know but the answer is probably yes. Weep at the beauty and weep with the sorrow. Together they come. And how else could it be? Primal Derma tries to be in this same tradition of remembering these old ways – something had to be laid low to you to have it in your presence. Ever was it thus but we are trying to remind anyone we can about the way it is. If you need some – we’d love to send some to your door. Thanks for being a user of Primal Derma and for reading these missives.